According to a new market report published by Transparency Market Research titled Rebar Processing Equipment Market (Type: Bar Bending Machine, Bar Shearing Machine, Bar De-Coiling & Straightening, and Others (Radius Bending Machine, Stirrup Bending Machine etc. ); Operation: Fully Automatic and Semi-Automatic; End-user: Steel Producers, Steel Products Manufacturers, Construction/Engineering Contractors)– Global Industry Analysis, Size, Share, Growth, Trends, and Forecast, 2018 – 2026,’ the global rebar processing equipment market was valued at US$ 0.55 Bn in 2017. It is expected to reach US$ 1.07 Bn in terms of revenue by 2026, expanding at a CAGR of 6.9% from 2018 to 2026. The market in Asia Pacific is likely to expand at a rapid growth rate during the forecast period, due to a rise in infrastructure and construction activities in emerging economies such as India and China. Rebar processing equipment is mainly used for bending, shearing, de-coiling, and straightening of reinforced bars (also known as rebar). This machine is suitable for contractors or construction companies to carry out different operations on rebar according to their requirements. The rebar processing equipment market is growing across the globe. Major factors driving the market are growing construction and infrastructure activities. 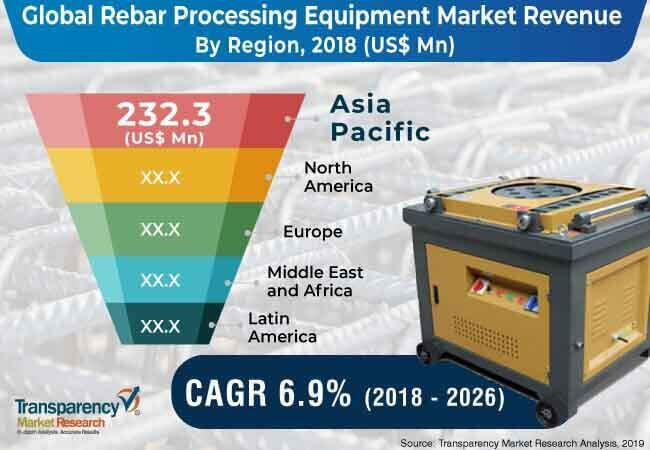 China, India, and the U.S. are major countries which have a huge demand for rebar processing equipment due to an increase in infrastructure activities by both the private sector and governments in these regions. Additionally, usage of advanced technologies is increasing the productivity of equipment. However, the entry of local and regional players and instability in the construction industry is hampering the business growth of established players. In terms of type, rebar processing equipment can be categorized into bar bending machine, bar shearing machine, bar de-coiling and straitening, and others. Bar bending machine has dominated the market because of its usage across the construction industry and steel industry, including steel product manufacturers and steel producers. In terms of operation, the rebar processing equipment market is bifurcated into semi-automatic and fully automatic. The fully automatic segment has major share due to convenience and efficiency. In terms of end-users, the market is segmented into steel producers, steel product manufacturers, and construction/engineering contractors. Construction segment is expected to remain dominant in the coming years. Development of smart cities in emerging economies, and growth in demand for steel products in infrastructure and real estate sector are major drivers of the segment. In terms of region, Asia Pacific and North America commanded major share of rebar processing equipment in 2017. The U.S., China, and India hold half of the global market share. The rebar processing equipment market in emerging economies is estimated to expand at a significant growth rate during the forecast period. Demand for rebar processing in Middle East & Africa is estimated to increase as it is widely used for bar cutting and bending due to growth in the construction sector. Demand for rebar processing equipment is expected to rise in the near future with the growth in construction industry worldwide. The global rebar processing equipment market is highly competitive. It is dominated by several international and domestic players. Key vendors operating in the global rebar processing equipment market include Jaypee Group, Schnell Spa, Ltd., Gensco Equipment, EVG Entwicklungs- und Verwertungs-Gesellschaft m.b.H., KRB Machinery, Eurobend, PEDAX, Ltd, Henan Sinch Machinery Co., Ltd, Toyo Kensetsu Kohki Co., TJK Machinery (Tianjin) Co, and Everest Equipment Private Limited. A large number of local and regional players are expected to increase the competition in the global market. Key players are mainly focusing on research & development activities and product innovation in order to strengthen their presence in the market.